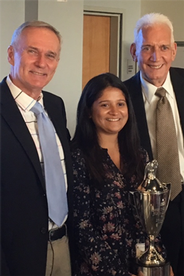 (L to R) Rodger Streitmatter, Anagha Srikanth, and Thomas Grooms at the April 18 award ceremony for the Rodger Streitmatter Journalism Award for Excellence. Photo by Nicole Cusick. The Rodger Streitmatter Journalism Award for Excellence began as a surprise birthday gift by Streitmatter's husband, Thomas Grooms. "Rodger has taught at AU for more than 35 years-most of our life together," said Grooms. "Since he was a former journalist before he started teaching, I wanted to do something for journalism. Journalism has been under siege in recent years and has changed a lot in terms of technology, ethics, and teaching. The award is a way to reinforce the value of journalism and truth-telling." The Rodger Streitmatter Journalism Award for Excellence honors a journalism student who is graduating from AU and transitioning to a career in journalism. The award criteria are not just about scholarship and other academic achievements; in addition to identifying a student who did well in school, the award seeks to recognize a student who is committed to journalism. The award recipient receives a monetary award-$2,000 this year-and a certificate, as well as his or her name engraved on a trophy permanently displayed in the School of Communication. Streitmatter, a full professor in the School of Communication, explained, "I've been distressed by what has been happening in journalism in recent years so the award is a way to make a positive contribution to the field. The award helps encourage a gifted student to stay in journalism." Rodger Streitmatter. Go on the Internet and type in his name. Suddenly, the screen is rife with information about and photos of his scholarly accomplishments. Nine academic books in 22 years. What an Internet search doesn't reveal, however, is the truth about Rodger's most enduring accomplishment-about who he is, and what is his passion and proudest professional achievement: teaching. He loves his job. He constantly challenges his students with new information and diverse perspectives. In turn, he is challenged and energized by them. Like his writing, his teaching is straightforward, accessible-not crammed with academic jargon and esoteric communication theory. He consistently goes 'the extra mile' for his students, giving them abundant feedback on their writing and other assignments, providing them with every opportunity to learn and to improve. To publicly honor Rodger's many years of teaching and mentoring, along with his life-time commitment to journalism, I established, in collaboration with the AU School of Communication, and have endowed, the Rodger Streitmatter Journalism Award for Excellence. It is my gift to him-and to the School of Communication. The inaugural winner of the award is Anagha Srikanth, SOC '17. In the essay that helped earn her the award, she said, "There's a feeling many people experience when they're standing on a ledge… for me, it's this feeling of equal fear and excitement that tells me I'm making the right next step into my future. It's also the feeling I get just before any interview with a source-whether a teenager walking down the street or the president of a major organization." Srikanth's essay continued, "My grandfather is a political satirist who leads his own theatre troupe in Bangalore, India, and by the nature of his profession, my family was engaged in a variety of social circles. From a young age, I had to be able to converse with artists, politicians, businesspeople and the common man all in the same breath-a practice that has now become second nature to me. Storytelling is the family business. I prefer pages of words." Srikanth discovered her words could "affect change, change minds, and change the business of the world bustling around me." Srikanth interned almost every year she was at AU. She said, "it was one of the reasons I came here; I've always learned better hands-on." The journalism student had opportunities at the travel section of USA Today, the Jordan Times (Jordan's English language international paper), the multimedia desk of Agence France-Presse (AFP) and copy editing at the Virginian-Pilot. Additionally, Srikanth worked at The Eagle, AU's award-winning student-run newspaper. "The award is a validation of deciding to go into journalism. It's not easy to find your way in the industry. The award is an indication I'm doing something right and is a motivation to keep going," said Srikanth. The award recipient is currently job hunting, "looking for something in print journalism-my major and my interest." In designing the award, Grooms and Streitmatter hope the monetary award will help each year's winning college senior have some time and flexibility in job seeking. Grooms recognized that by endowing a gift now, he could recognize Streitmatter and do something for SOC while they both can see and enjoy the value rather than waiting to leave a bequest to the school through their estate. "It is tangible-a way to see how the money is being used," said Grooms. In speaking of the importance of philanthropy, Grooms said, "Power and prestige are not the goals one should seek. Happiness is what we should seek-to be happy requires being generous and caring. No one can feel happy without being generous. Giving in some ways is selfish, because in the end, the giver receives the greatest return. Rodger and I are trying to do more in our own lives while we are still alive. We believe in giving locally and for specific projects as much as possible." For information about how you can support student achievement in the School of Communication, contact Nada Maalouf at maalouf@american.edu or 202-885-2652.